Diocese of Rochester | Psst, have you heard about JustOne? Psst, have you heard about JustOne? 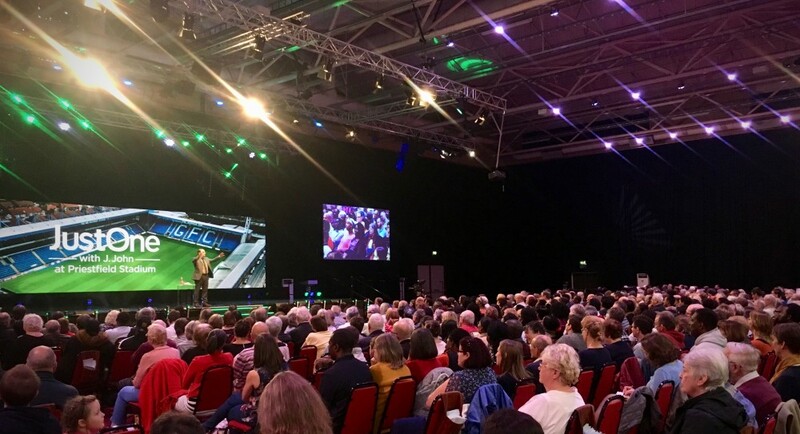 A mission event led by popular evangelist, J.John, is set to take place in the Priestfield Stadium - home of Gillingham FC - on 9 June next year. At a recent taster event, Christians across the region were encouraged to take part by inviting ‘just one’ person along. Peter Marchand, chairperson of JustOne Priestfield explains more. Who’s J. John? J.John is an evangelist, he tells funny stories, and helps people to discover just how amazing God is – you could search on line for videos of him in action. He wrote the “Just10” series on the Ten Commandments which have been seen by a million people now either live or recorded. Why taking over a football stadium? It all started with a vision, of gathering large crowds of people to hear the gospel - a bit like Billy Graham for the 21st Century. Earlier this year the first JustOne event happened at the Emirates Stadium in Islington. Priestfield on June 9 2018 will be the second big event. Who’s this for? This is much wider than just Anglican – at our launch event in October almost 600 people turned up from across the whole spectrum of churches. It was a really encouraging morning. What are some of the ways people get involved between now and June? Share - Tell every Christian you know (not just the Anglicans) who lives in the region. Get it into your church’s calendar for the year, and avoid other big events on the weekends either side if at all possible. Pray – Pray every day for the person you hope to invite – maybe they will accept your invitation when you ask them. Prepare yourself - Most of us don’t have much courage when it comes to inviting ‘not yet Christians’ to an event – so find new courage and confidence by being trained.